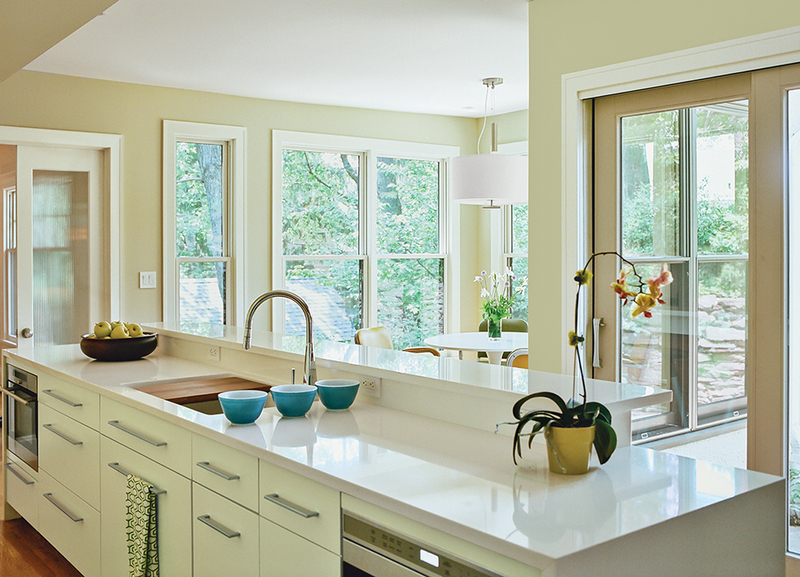 Dan Pacek and John Roynon of Leonia, New Jersey, expanded and renovated their tiny kitchen, integrating it more sensibly into their 1911 house while borrowing natural light from secondary sources, such as a window on the landing leading to the second floor. Pacek and Roynon carved out room to expand their kitchen by building an addition that they integrated into the facade of their house. Roynon coated the wooden legs of the Vig bar stools by BoConcept with Atmospheric, a grayish-blue paint from Benjamin Moore, so they would stand out against the island’s walnut-veneer base. Dan Pacek, left, and John Roynon prepare cocktails at their 12-foot “display island” in the renovated kitchen of their home in New Jersey. The couple bought handles matching those on their Thermador refrigerator and used them on a set of pantry doors, one of which conceals the steps to the basement. An obtrusive wall was removed, and the back of the house was pushed out to create a breakfast seating area with expansive views of a landscaped backyard. The cabinets are by Kountry Kraft. The Indio sink by Kohler has a built-in walnut cutting board, and the faucet is by Gessi. Where the old kitchen was defined by a confining U shape, new doors now lead to a stair landing and the dining room. Counterweights Drum pendant lamp by George Kovaks from Lumens hangs above a Docksta table from Ikea. Pacek and Roynon peeled away wallpaper to reveal layers of old paint that serendipitously complemented the color scheme of their new kitchen, and used a circular frame to preserve a section of it. The matte-chrome handles and pulls are by Mockett. The house as it appeared from the backyard before the addition. The kitchen is housed within a 615-square-foot addition to what had been a 1,547-square-foot house. The breakfast nook and a renovated and expanded master suite on the second floor overlook a newly landscaped backyard. The yard includes a patio and a hill, at far left, with a secluded seating area that Pacek and Roynon call "the camp." Much of the cooking and cleaning takes place at the rear counter, which is outfitted with an Evoke faucet by Kohler. A view across the display island to a breezeway betweent the house and the garage that Pacek and Roynon created as part of their home addition. They use the space for entertaining and food service when the weather cooperates. In northern New Jersey, a cramped kitchen is reborn as a welcoming space for cooking and entertaining. 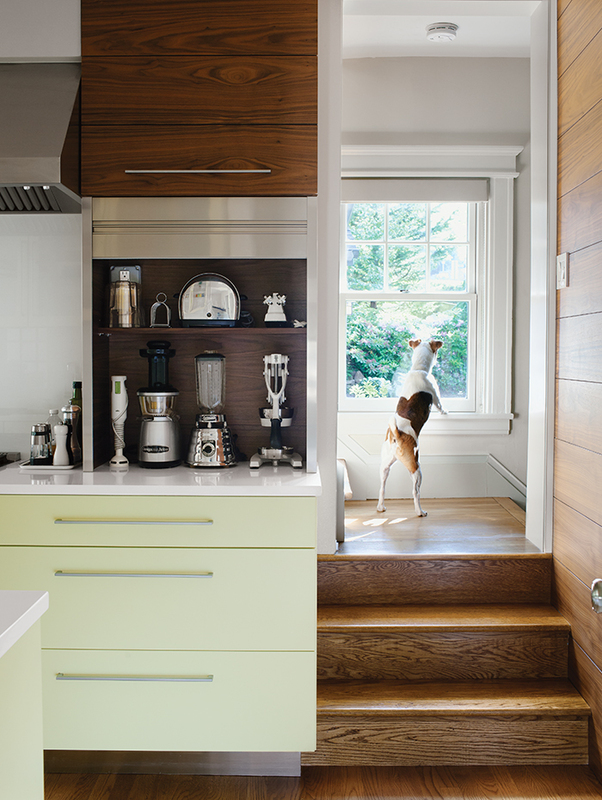 Decked out in a subtle yellow, the kitchen houses a Wolf drawer microwave tucked unobtrusively under the counter in the display island. A Wolf E-Series steam oven with convection capacity occupies the opposite end of the island. "It's great," Pacek says. "You can steam a whole tray of vegetables at the same time, and it's very quick for reheating. Even though we have a built-in microwave, we often use this for reheating; it's just as quick." 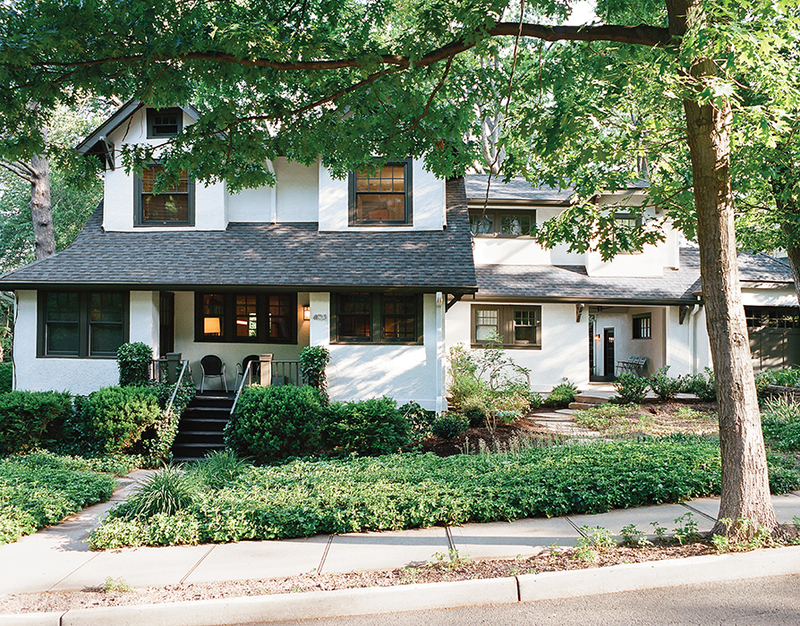 When Dan Pacek and John Roynon moved to the New York City area from Cambridge, Massachusetts, in 2002, they settled in a 1911 American Craftsman–style house in Leonia, New Jersey, minutes from the George Washington Bridge. The house, with its oak floors and vintage woodwork, was well preserved and much to their liking, but there was one glaring exception. A wall, concealing plumbing from the upstairs bathroom, disrupted the flow in and out of the kitchen and contributed to its dark, uninviting feel. When company came by, one of the hosts inevitably would find himself sequestered in the kitchen, cut off from the conversation and merriment unfolding in the living room. They ended up adding 615 square feet of living space to the 1,547-square-foot house. Extending it on one side allowed for the addition of a new master suite upstairs while creating enough room below for an expansive and inviting L-shaped kitchen. The obtrusive wall was removed, and two new entrances were created—one leading to the dining room, the other to a landing on the stairway that is outfitted with a window—on either side of what had been the far end of the old kitchen. At the opposite end, a bump-out offers expansive views of the newly landscaped garden. The couple furnished the space with a round Ikea table and a set of aluminum office chairs salvaged years ago from a medical office building in western Pennsylvania that Pacek’s father, a family physician, once managed. A 12-foot “display island” gives the kitchen programmatic function—food and drinks are prepared here; cooking and cleaning are consigned to the back—and helps make it a welcoming space, whether Pacek and Roynon are entertaining or simply enjoying time to themselves.